2018 marks an important milestone in the restoration of The Basilica Landmark. 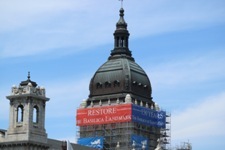 This past year, exterior tuck-pointing was completed on The Basilica dome—reaching over 138 feet in the air. Throughout the past 25-years tuck-pointing repairs have been made to various sections of the church exterior. Annual tuck-pointing mitigates and prevents future structural damage. Restoration and mason crews worked every- day, from May to September, to repair each mortar line around the beautiful white granite stones on the dome. These stones were originally placed in 1908 and provide the structural support for the pinnacle copper dome. The process started by installing a construction elevator on the east side of the church to bring all of the equipment, people, and materials to the top of the structure. 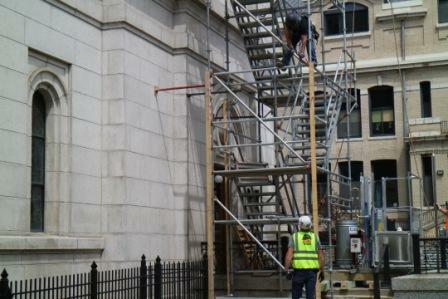 The scaffolding was secured to the side of the church for the crews to work on each of the four sides of the dome. The tuck-pointing process is slow and meticulous work to drill out each old mortar joint and replace it with new mortar. Crews can not work on the scaffolding in high-winds or other extreme weather conditions. Crews report back all of the items they discover between the stones, including trees growing in cracks, and dirt and trash that has worked its way in over the years. These crucial tuck-pointing repairs will prevent moisture from seeping in to uphold the structural integrity of The Basilica of Saint Mary and preserve it as our shelter for generations to come.